You exercise your dog regularly, feed him healthy food, and give him his heartworm medicine on the first of every month. If you want to keep your dog as fit as can be, you must remember one other crucial element of his health: the mouth. Doggy dental care is just as important as any other aspect of your pooch’s wellbeing. This is how to do it right. 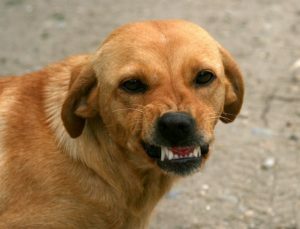 Why do dog’s need dental care? You might be surprised to learn 80% of dogs show signs of canine periodontal disease by the time they are three years old. It may not seem like a vital part of your dog’s health, but gum disease can lead to serious consequences like tooth loss and damage to the heart and kidneys. The first indicator that your pup may have the disease is bad breath. The unpleasant scent is caused by bacteria forming plaque and gingivitis. If untreated, plaque matures and gum disease progresses. As a result, more destructive bacteria lead to organ damage. Healthy dog dental care can begin as soon as your puppy gets her adult teeth (around six months old). 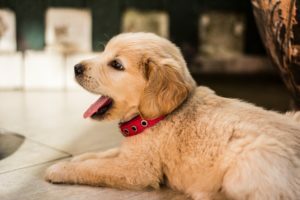 Once those chompers grow in, it’s time to teach your puppy about keeping her teeth and gums clean. Introducing the habits when your pup is young will get them comfortable with teeth brushing. You can start by gently rubbing your finger on your puppy’s gums. Get a finger brush to introduce your dog to the sensation. If you adopt a dog later in their life, the finger brush is a gentle way to accommodate your pup to dental hygiene. Use a dog-friendly toothpaste. Your pup will love the flavor and the taste will make the experience more enjoyable. Once your pup is okay with the finger brush, you can move on to a real toothbrush. Use a circular motion and focus on eliminating plaque the best you can. Watch this video for more tips to make this process as painless as possible. Most vets recommend brushing your dog’s teeth every day. Try to make this a regular occurrence to prevent the growth of plaque and gingivitis. Brushing at home is a fantastic way to keep your dog’s mouth healthy. However, like humans, dogs need dental cleanings, too. These must be administered by a veterinarian to get the full effect. A visit to the vet for teeth cleaning is similar to that of a visit to the dentist. The doctor will thoroughly clean your dog’s teeth with a scaler and check the gums for recession. However, dogs must get general anesthesia so that they remain still during the cleaning. Don’t be alarmed by this requirement. Today’s anesthesia is extremely safe and common. Your dog may also get X-rays or even have teeth pulled if the doctor deems it necessary. Prices vary, but you can expect to spend a few hundred dollars for a cleaning. If your dog needs more extensive dental work, like extractions, the prices increase significantly. That is another reason why it is important to practice dental hygiene at home. There are tools to make tooth brushing easier for you and your pup. These are some of our favorite products. 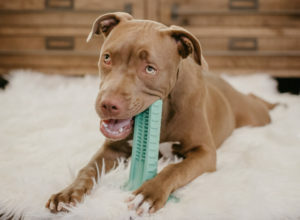 Brite Bite Brushing Stick: This brushing stick takes the human element out of cleaning your dog’s teeth. Here’s how it works: your dog bites down on the animal-safe rubber and scrubs his own teeth. All you need to add is your dog’s favorite toothpaste and he can do the work. The stick gives your pup a sense of control over the experience. Bonus: this stick is especially good for cleaning your pup’s hard to reach back molars and it’s dishwasher safe. Grain Free Triple Enzyme Dental Sticks: These treats are a supplement to teeth brushing. They are designed to control plaque, reduce tartar buildup, freshen breath, and help maintain healthy teeth and gums. The sticks contain no artificial colors and are grain and gluten free. 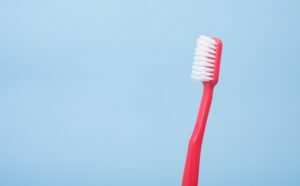 Tartar, Plaque, & Bad Breath Control Antimicrobial Dental Wipes: Instead of wrestling with a toothbrush, try these wipes. The wipes contain a solution to help reduce the plaque, dental calculus, and tartar buildup on your pup’s teeth over time. Another perk: the formula reduces the bacteria that cause bad breath in dogs. Your dog’s dental health is important. Bacteria start small but can grow into bigger health problems. So start now – before there’s a problem. Brush your pup’s teeth regularly and get him toys that allow him to take charge of his own dental care. Regular visits to the vet and professional cleanings will protect your dog from potentially harmful diseases.